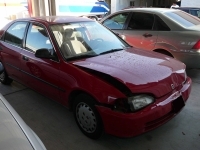 Fate is often unkind to the exterior of cars, exposing them to all types of damage - from the impact of other vehicles crumpling their sheet metal and possibly their frames, to collisions with stationary obstacles causing dents and buckling, to the effects of accidental blows against the outside of a car. 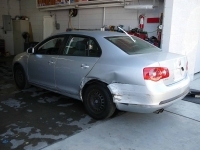 However this damage occurs, it seriously disfigures the outside of a car, lowers its resale value, and is the potential starting point of rust. Fortunately, there are almost as many ways to remove dents and damage from the surface of a car as there are to cause them. Over a century of research and thought have gone into devising methods of repairing auto bodies, and the modern repairman has more options than at any other time in the history of cars. Many of these techniques can be carried out with equipment that a very reasonable price, putting auto repair within easy reach of the home car enthusiast as well. Painting over chips and scratches often intensifies the problem. The damaged area should be machine sanded and featheredged so the rough edges are gradually tapered back. This insures that the edge will be invisible, and the new paint finish will look smooth and glossy.